A description of the preload and directions how to re-preload. Why the preload is important and how to re-preload your Voyager. Only 20 psi on Voyager tires. Make sure that motorcycle rear air shocks are at 80% capacity. Normal tire pressure on both motorcycle tires. Tools needed: 3/4”, 7/16”sockets or wrenches and a torque wrench. The more preload the less lean you will have with the motorcycle inside the Voyager Kit. Now you are ready to ride again! 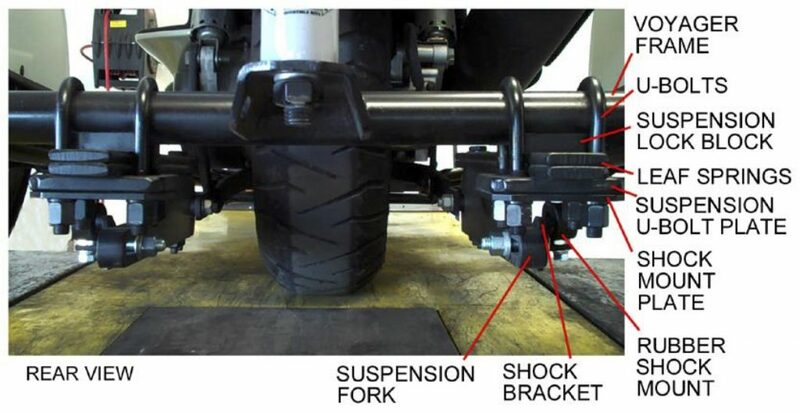 On Voyagers with the shocks on the inside of the rear mud guard, remove the mud guard. 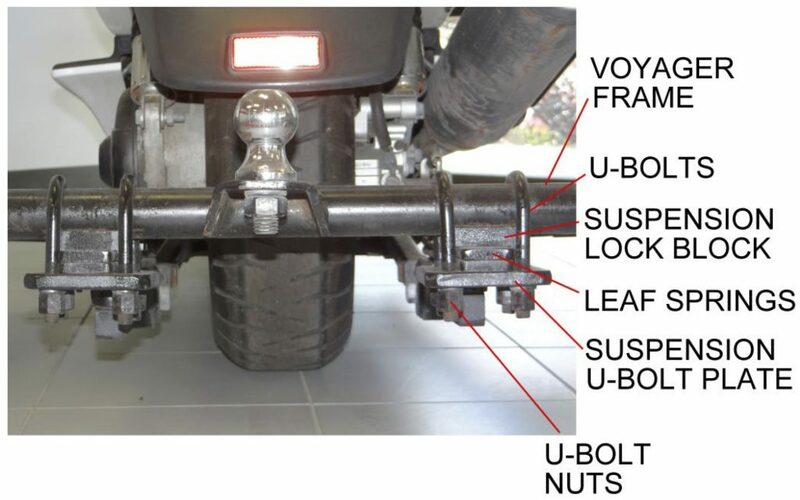 On Voyagers with the shocks to the outside of the rear mud guard, removal of mud guard is not necessary. Tools needed: 3/4”, 7/16”, sockets or wrenches and a torque wrench. Remove the 1/2” Short Shock Tower Bolts, nuts, washers, spacers completely from top of shock and shock tower. Reinstall short shock tower bolts, washers, nuts, & spacers (as shown in picture) and tighten completely. 250cc to 600cc should not require preload. 700cc to 800cc should not require preload. Preload would be required if the riders weight is over 150 pounds. Use 1/4" preload. 900cc to 1800cc cruiser motorcycles will use 1/4" preload. Goldwings all require 1/2" preload. Sportster 883cc & 900cc should not require preload. Preload would be required if the riders weight is over 150 pounds. Use 1/4" preload. Sportster 1000cc to 1200cc use 1/4" preload. All Dyna's use 1/4" preload. 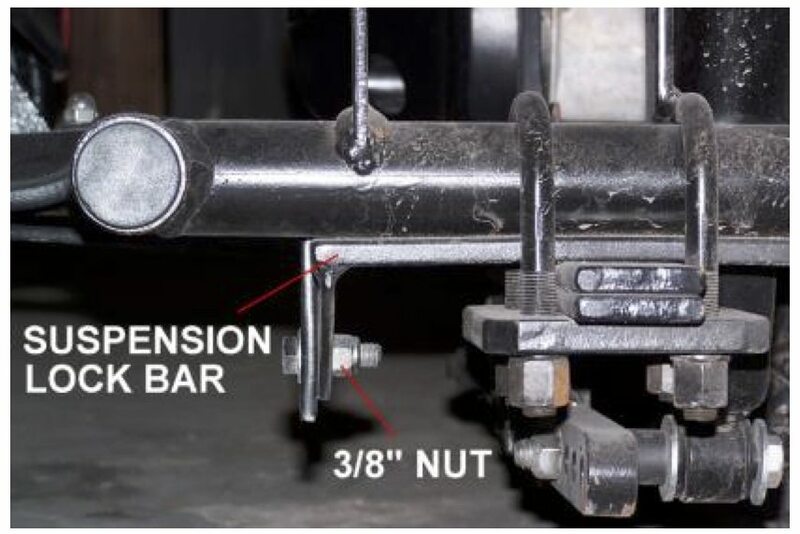 All Softails use 1/4" preload. All Dresser models including Road King and Road Glide require 1/2" preload. 500cc to 1100cc use 1/4" preload. 1200cc to 1500cc use 1/2" preload. 535cc to 750cc should not require preload. Preload would be required if the riders weight is over 150 pounds. Use 1/4" preload. 920cc to 1850cc use 1/2" preload. 650cc should not require preload. 1400cc to 1800cc use 1/2" preload. 1000cc to 1100cc use 1/4" preload. 700 & 740 does not require preload.